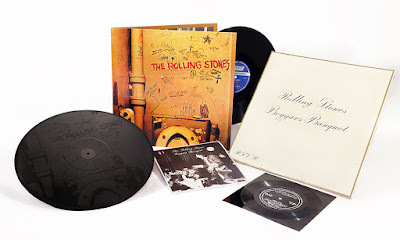 The Rolling Stones will release a 50th anniversary reissue of their 1968 album “Beggars Banquet” on November 16. Previewed with a new lyric video for the set’s original lead single, “Street Fighting Man”, the project was the final album completed with the original lineup of Mick Jagger, Keith Richards, Brian Jones, Bill Wyman and Charlie Watts. Available in all formats and remastered by famed engineer Bob Ludwig, the new vinyl version will feature both the original Michael Vosse photograph of a bathroom wall – which was originally rejected by Decca Records in the UK and London Records in the U.S. – as well the the wedding-style RSVP artwork that replaced it. With the 1969 release of “Beggars Banquet” in Japan, the album included a 7" flexi-disc capturing a telephone interview between Mick Jagger and a representative of the Stones’ Japanese label King Records. The rare artifact’s title translated to “’Hello, This Is Mick Jagger!’ LONDON to TOKYO April 17, 1968” has been restored and reissued on flexi-disc with identical sleeve art. The vinyl package will come in gatefold jacket, with a bonus 12” of the hit single “Sympathy For The Devil” in Mono cut at 45rpm, backed with an etching of the original washroom cover art. Ahead of the reissue, The Rolling Stones will release a 50th anniversary edition of their 1968 documentary, “Sympathy For The Devil”, on October 5.